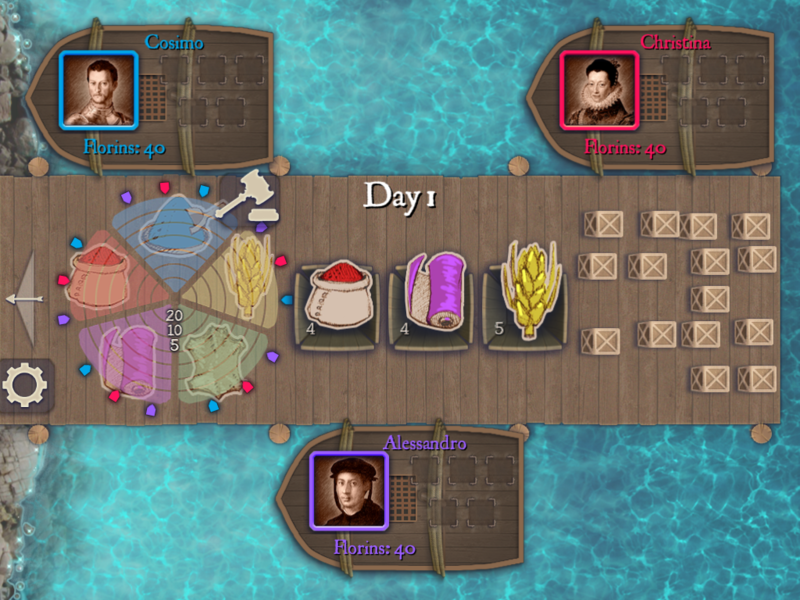 In Medici, players are merchants bidding over goods at the dockside so they can load their ships. There are 5 different types of goods and each good tile has a value from 0 to 5 on it too. On their turn, a player draws 1 to 3 goods one at a time and then auctions the good(s) off as a single lot with the current player bidding last. Players get just one chance to bid and can only ever buy a total of 5 goods in a round. If no-one bids on a lot they are thrown into the sea. A round ends when the goods run out or all players have their full 5 goods each. 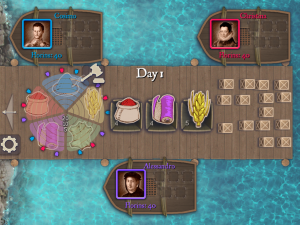 At the end of a round, players potentially gain florins for their ships and their goods. Ship’s Score: Players each total the values written on their goods tiles – the player with the highest total number gains 30 florins and the next highest amounts gains florins too – the exact amount of florins and the positions that score are based on the number of players playing. Goods Sore: Each good tile (regardless of the value written on it) moves its owner’s marker one step along the relevant goods track (i.e. two cloth tiles would move the player’s marker 2 steps along the cloth track). The player furthest along each goods track scores 10 florins and second most scores 5 florins. Players score bonus florins if their marker is on any of the last 3 spaces on a goods track. At the start of each round all goods are removed from the ships but the player’s markers on the goods tracks stay where they are. The game lasts three rounds – player with the most florins wins. I had played Strozzi and Medici versus Strozzi before but had not played Medici until now so it was great to give it a try. Medici has a lot of similarity to Medici versus Strozzi – in fact, it feels like it could have started life as a 2-player version of Medici. It’s a fun game to play – quite light and easy to complete a game in 10 minutes. Also, it has a good feature that you can switch to a different app and it will allow you to continue your game – a feature still lacking in too many iPhone games. With limited money, players need to balance gaining florins from the goods tracks, and from the ship scoring, without spending too much. It’s important to do well in a few scoring areas because scoring at the end of a round is the only way to earn florins. The auctioning is quite tense as you only get one chance to bid in an auction and working out what a sensible bid is can be quite tough especially as it depends on which goods opponents may want. There are some tactics to be had in knowing when to stop drawing goods and start an auction – you might only auction off 1 or 2 goods because it’s a mix of goods you want; however, you may purposefully auction 3 goods because you know only one opponent can bid on it (as the rest don’t have space for 3 more goods in their ships). The game’s interface does a very good job of fitting so much onto a small screen at once, especially because it’s arranged for a 6-player game when you need to see all 6-players’ purchases and cash. I do have two main issues with the interface though: my first is that the font for the florins scored each round is small and thin which makes it hard to read especially when it’s in motion. A bigger font would have been better and still have been on-theme. My second issue is the way a player can increase their bid – the way the ‘Bid/Pass’ choices move to below each player’s ship is a good visual to help the player see who is doing what, plus it’s large enough to read easily. However, it’s very small when considered as something to tap on wioth your fingers. The Bid and Pass are very close together, the arrows used to set (increase/decrease) your bid are very small indeed, and when you tap on an arrrow you can’t see the total bid. Now, the programmers have displayed the total bid being set on the player’s picture, which is above the buttons so it’s above your finger, but it can still be obscured by your finger and is hard to read. I would have preferred if when it came to a player’s bid that the Bid/Pass interface was made large and in the centre of the screen overlaying the crates on the wharf. Then it could have been large enough to be easy to use without obscuring anything required. However, the interface issues above are minor items and I am impressed with the way all the information has been fitted on screen simultaneously. Animation is smooth and you can vary its speed too which I like because, like most iPhone board games, after a few plays you usually just want to speed up the AI so you can play your turns. If you can’t bid any more in a round, because you’ve already bought your 5 goods, I would liked to have had the option to skip past the AI players playing amongst themselves as you have to sit out, but that has been rare. The AI seems to be quite good so far as I’ve won as many as I’ve lost. Occasionally, I notice that one AI player will buy something they don’t need at all and I can’t figure out if it’s being clever by trying to deny me those items, or being random – hopefully it’s the former. Being able to have all human players is nice so you could pass the iPhone around for a 6-player game. (I once played Worms for over 6 hours on a plane against 2 work colleagues by passing our laptops back and forth – when the batteries ran out on one laptop, we used another one – so this ‘hot seat’ style play (as it used to be called in the 90’s) can be very useful). The multi-human playerplay would work well on the iPad which has a very good viewing angle when placed on a table. I like Medici iPhone – a few small niggles bit overall a well-executed iPhone board game. Want to purchase Medici for iPhone or iPad? Use a link below to go to the App Store and 4% of your purchase will go towards maintaining this site (at no extra cost to you). This entry was posted on Friday, September 24th, 2010 at 10:00 am	and is filed under iPhone, iPhone Review, Medici. You can follow any responses to this entry through the RSS 2.0 feed. You can leave a response, or trackback from your own site.